Snippets of Jack: "Sometimes Things Come Back Mate"
"Sometimes Things Come Back Mate"
After Jack successfully gets the crew back out of the land of the dead, Barbossa, Will, Jack, Elizabeth, and Gibbs are no longer on the same side trying to get out of the nasty place. They all want something of the others that obviously requires a pistol to do the work. Barbossa looks out at the beautiful setting sun, gives a nice smile showing how happy he is that Jack got them there, and then points his gun at Jack. And then once one gun is out, they're all out. Barbossa, Jack, Will, Elizabeth and Gibbs all stand in circle with a gun in both hands, pointing them at the peeople to the left and right of them. Elizabeth has a gun pointed at Jack, so naturally he points one back. Elizabeth finds this very offensive, gasps dramatically, and gives him a cold look. Jack the monkey decides to join in the fun and points his gun at Cotton's parrot. (Why does a monkey have a gun?) Parrot: "Parley?" Pintel and Ragettie, who had the brilliant idea to tie themselves up side down frantically try to join the gun party. Pintel: "We need our pistols! Get untied, hurry!" Everyone is glaring at eachother in the circle. Then Barbossa, who first pulled out his gun, starts to laugh creepily. Everyone starts to laugh and lower their weapons. Barbossa leads the way again. Barbossa: "All right, then!" Everyone's gun is back out. Barbossa: "The Brethren Court is a-gathering at shipwreck Cove. And, Jack, you and I are a-going. There'll be no arguing that point." Jack: "I is arguing that point." You has good gramar. Jack: "If there's a pirates a-gathering, I'm pointingmy ship the other way." He owes them all to much money to confront them. Elizabeth points her two pistols at him. Elizabeth: "The pirates are gathering to fight Beckett, and you're a pirate." Who told you? How did you know? Jack moves both of his guns at Elizabeth; this time she doesn't make a scene about it. Will reacts by pointing guns at Jack too. Will: "Fight or not, you're not running, Jack." Jack points one pistol at Will and one at Elizabeth. Barbosssa: "If we don't stand together, they'll hunt us down one by one, till there be none left but you." Jack: "Quite like the sound of that. 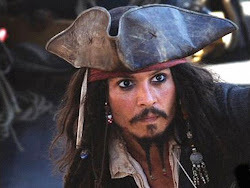 Captain Jack Sparrow, the last pirate." Barbossa breaks through the circle and points one gun at Jack and the other a Gibbs (who is always loyal to Jack). Barbossa: "Aye. And you'll be fighting Jones alone. How does that figure into your plan?" Jack: "I"m still working on that. But I will not be going back to the Locker, mate. Count on that." Please don't or everyone will have to sail to the end of the world to get you again. Jack pulls his trigger to fire at Barbossa, but all that comes out is water. Everyone fires their guns but get the same reaction. Gibbs: "Wet powder." Pintel: "Wait! We can still use them as clubs!" With good reason, everyone ignores him. Except Ragetti who tries out this theory by hitting Pintel on the head. Ragetti: "Sorry. Effective, though." Will, realizing they can do nothing without supplies pulls out the map. Will: "There's fresh water on this island. We can resupply there and get back to shooting eachother later." Jack: "You lead the shore party. I'll stay with my ship." Maroon him on an island the way he did to you? But you would still need those supplies. Barbossa: "I'll not be leavign my ship in your command." Okay Barbossa, let me help you get this straight. THE BLACK PEARL IS NOT YOUR SHIP!Jack paid a very high price for that boat and then killed you to get it back. It's time to let go. Will: "Why don't you both go ashore and leave the ship in my command." Everyone looks at him like he's crazy. Will: "Temporarily." They reluctantly agree. Jack and Barbossa lead a party to shore to get supplies. As usual, Pintel and Ragetti are part of the party, also as usual they have trouble getting their boat to shore. The wave flips over their row boat. What are we going to do with them? When they finally get to shore (soaked), they find the dead kraken washed up on the sand. Ew. Pintel: "Criminy." Ragetti: "Odds bodkins." Those are some creative catch phrases. They slowly approach the beast. Pintel: "You stupid fish!" Now now now, let's honor the dead. Ragetti: "Actually it's a cephalopod." So you know all about mystical biology but you can't row a boat? Yet you're a pirate??? Where is the sense? They start to climb up the beast as though it were a playgound. Ragetti: "Pin, I bet people would pay a shilling to see this. And another shilling for a sketch of them sitting atop." It probably smells teribble. Pintel: "Pintel and Ragetti, kraken slayers." They are just too mature. But wait, it gets better. Ragettie: "We could serve up a slice as a sourvenir." Yes, who wouldn't want to just carry around a piece of dead sea monster with them all over the place. Meanwhile, as these fools play around with the dead monster, Jack looks woefully at it, realizing what Beckett has done. Barbossa: "Still thinking of running, Jack? Think you can outrun the world? (If anyone could, Captain Jack Sparrow would be the one) You know, the problem with being the last of anything by and by, there be none left at all." Jack: "Sometimes things come back, mate. We're living proof, you and me." Barbossa: "Aye, but that's a gamble of long odds, ain't it? There's never a guarentee of coming back. But passing on, that's dead certain." Eventually, everyone meets the dead end. Jack: "Summoning the Brethren Court, then is it?" Barbossa: "It's our only hope, lad." Jack: "That's a sad commentary in and of itself." Barbossa: "The world used to be a bigger place." Beckett said something similar to that to Will in the second movie. Jack: "The world's still the same. There's just . . . less in it." Words to live by. In the Pirates of the Caribbean: The Price of Freedom Jack says he enjoys reading poetry. Clearly he himself is also a poet. So you're probably thinking, what's the big deal about a dead kraken? It was a terrible and scary creature anyways. Well here's the thing: the kraken was a great part of the pirate life. It belonged to a pirate: Davy Jones. But now with the rise of Beckett and the East India Trading Company, the pirate world seems to be slowly disappearing and the death of this mighty creature makes the E.I.T.C. look even stronger.